Voted one of the most influential business ideas ever presented in the Harvard Business Review the Balanced Scorecard enjoys global popularity. There are some management tools that seem to have enduring appeal and the Balanced Scorecard, or BSC for short, is one of those. Over the past 20 years it has seen adoption rates soar. At the same time I have to say that as a tool the BSC is still widely misunderstood and misused by managers. I have developed hundreds of scorecards for clients from across the globe including many blue chip companies, government organisations as well as small and medium size corporations. Based on that experience I believe that the BSC is one of the most powerful management tools ever invented. However, I also think that the majority of scorecards in use today are not only useless but often dangerously counter-productive. So let's once and for all look at what a good BSC is and the key pitfalls to avoid. What is a BSC for? Define and manage action plans - ensure activities and initiatives are in place to deliver the priorities and strategic objectives. I often use a shipping analogy to explain the importance. Just think of an old fashioned Viking ship that has rowing crews along each side. The first thing we need for a successful voyage is a plan. The captain and crew would map out the sailing route detailing how they will sail from their departure port to their destination, outlining the key milestones along the journey. The second thing they need are navigation instruments that help them understand where they are on their journey. These are especially important once the ship has left the harbour and is sailing in the open ocean. Without reliable navigation they would be completely lost. Finally, they need to ensure the rowing crew takes the appropriate actions to move the boat forward in a coordinated manner and adjust course when needed. Exactly the same applies to companies. They need a map of where they want to go and how they intend to get there. They need performance indicators to understand how well they are doing against their plan. And finally they need to manage the initiatives, projects and action plans that will help them achieve their plan. 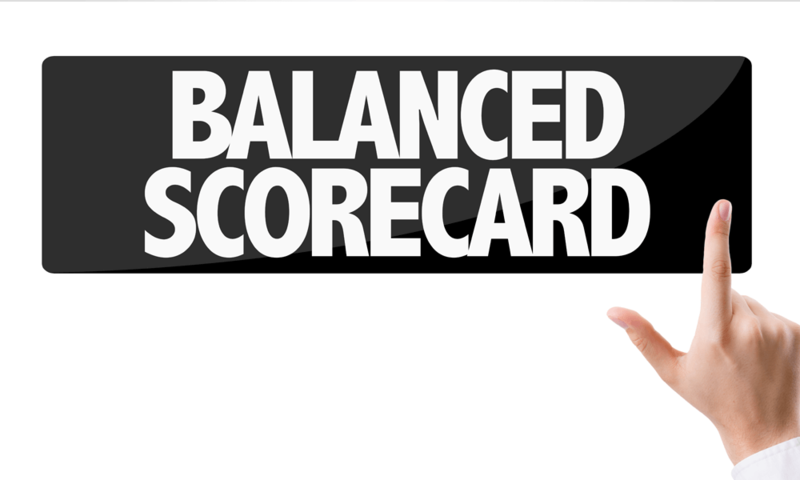 How many companies use the Balanced Scorecard? More than half of major companies in the US, Europe and Asia are using Balanced Scorecard approaches. The official figures vary slightly but the Gartner Group suggests that over 50% of large US firms have adopted the BSC. A global study by Bain & Co finds that the Balanced Scorecard is one of the top-ten most widely used management tools around the world. The widest use of the BSC approach has traditionally been in the US, the UK and Northern Europe, but there is strong growth in Balanced Scorecard adoption in South America, the Middle East, Africa and Asia. Mapping out how the objectives in each perspective support each other is one of the big benefits of a Strategy Map. Instead of listing strategic objectives in a seemingly unrelated manner, the Strategy Map depicts how each objective supports others and how they all help to reach the ultimate destination. 2. The second component of a BSC are Key Performance Indicators that allow companies to measure and monitor progress against their most important strategic objectives (outlined in their Strategy Map). Key Performance Indicators, or KPIs for short, are the vital navigation instruments for managers. Each KPI needs to be defined well and include targets or benchmarks. 3. The third component of a BSC is an Action Plan that ensures the right projects, programmes or initiatives are in place to deliver each of the strategic objectives on the Strategy Map. If all three of these components (Strategy Map, KPIs and Action Plan) are in place then a BSC can transform an organisation. It is such a popular and powerful strategy execution tool because it allows organisations to depict and communicate their strategic plan in a very simple and graphical way as well as monitor and manage the delivery of the plan.